Well, it’s Monday again. Seems like we were just here! This week so far is better than last was and I am so glad of that! We are feeling better and back to our usual routine. On Friday, Ian went to his preschool class and was thrilled to be there. He was out sick the rest of the week so it was nice to have him back. He had a fun day and was happy to tell me about it when I picked him up! Then Saturday morning, we went to the birthday part of a girl in his class. The theme was Tinkerbell and pirates. Ian dressed up as a pirate and had a great time. Kirk made him a sword out of a yardstick and paint stick with tape, and we rolled up his pants and used a few scarves for the rest of the costume. Here he is all dressed up! It was great! We received quite a few compliments for our creativity. It was fun and Ian loved it. After the party, the three of us went to Ian’s favorite Mexican restaurant. The food was good as always and our usual waiters were glad to see us. We then came back mid-afternoon and Ian and both took naps for a few hours. I hadn’t planned on that but we both needed it. After we woke up, it was time for dinner and watching the movie Unstoppable. Ian was fascinated with the train and how fast it went. It is a great movie! Sunday was a real day of rest. I feel bad that we skipped church again but we needed to. All three of us have been fighting a bad cold for a week and needed a bit more time to rest and get better. We had a nice breakfast, worked on puzzles, read, watched television, colored in a lighthouse coloring book, had some time on our computers, and Ian made three books of cars, vans, and buses. We also had a good lunch and dinner. It wasn’t the most exciting weekend but one where there was time to rest. All day Sunday it rained, so this morning there isn’t the layer of pollen everywhere. I think that has helped all of us. Hopefully this week will be better and the pollen will stay away for a while. I wonder what adventures this week will bring! I don’t know about you, but I can’t wait to find out. Friends are a gift from God! We chose our friends and make an effort to spend time with them, so they are extra special. I have been blessed in my life to have several lifelong friends. A few of these gals I have known for 30 years. That is amazing! It doesn’t seem possible. That to me sums up real friendship!! I also love that my friends and I can go for years not seeing each other but when we do, it’s like no time has passed. We pick up right where we left off. A friend loveth at all times! This is a great piece of scripture. Whether a friend from childhood, from my work life, from meeting while pregnant, attending a writing seminar, or hanging out at the beach, I have been blessed to meet and know many awesome people. I thank the Lord for each and every one of them! I hope that you too have such friends. There is so much more to say, but it’s time to say STOP!! May you be blessed with a friend-filled life!! Read more thoughts on “friend” at Lisa-Jo’s Five Minute Friday link-up today. Last night I couldn’t sleep very well. I don’t know why, but suffice it to say, it was not fun being up at 3 in the morning. So I started thinking of a variety of items, including wanting to write some blogs about music and songs that mean something to me. Music is something I have loved for many years. I like a huge variety and listen to many genres — music from the 1980s, classical, country, current pop, disco, and the list goes on. 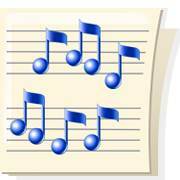 In addition, I have been in choirs, choruses, and musicals throughout my life. Sometimes I just want a good beat to dance to, but as a writer, there are those songs that are all about the lyrics. These songs are not fun and easy listening by any stretch but they have given me pause and made me think about a variety of things as a result. They have spoken to me and perhaps to you as well. “Jar of Hearts” was written and performed by Christina Perri. It was written about someone who she dated and hurt her very much. The lyrics are so amazing and on point that I stop and listen each time I hear this song on the radio. She has a gift for poetry that is for sure. Have you ever known anyone with ice inside their soul? Thankfully I haven’t or at least don’t think I do. Isn’t that an amazing description of someone who hurt her? Being a writer, I was blown away by the use of such a short line saying so very much — “You’re gonna catch a cold from the ice inside your soul.” Wow. May we live in a way that we not have ice in our soul, but instead warmth, love, and care for others. Do They Know It’s Christmas was recorded in 1984 by Band-Aid, a group of artists from Britain. It was used as a fund-raiser to feed people in Africa. Each Christmas season, this is one of my favorite songs because of the musicality of it. I sing each and every word and at the end, tears are running down my face. What an impact! The words give me chills just thinking about it. It also saddens me and makes me realize it is a call for action. It is and was a call to give and help others. I am fortunate to have an extended family who raises money to give to a needy person or family instead of buying one another Christmas presents. We have been doing this for several years and I am so glad and proud to be a part of it! Each year we get together to celebrate, enjoy our meal and our time together, and give gifts to the kids, and then discuss how much we pooled together. There is strength in numbers as I have fortunately learned from my amazing family. Seasons of Love is from the musical “Rent.” This musical is about a year in the life of a bunch of friends, several of whom have HIV or AIDS. The song speaks to the importance of love and how it can be a way to measure our life. I know a man who has HIV. He is in regular pain and has a tough way in life. Yet, he works hard each day and helps others. He is one of the most generous people I know with his time. He is truly someone to learn from. This song makes me think of how I spend my time. Am I truly making the most of my time and making great memories? I like to think so, but realize it isn’t always the case. Showing and sharing love and spending our time with loved ones is one great way to spend our time. A wise paramedic supervisor once told me, “Never be a grave hugger.” I think that is perhaps the best piece of advice I have ever received. He was saying to always let your friends and family know how you feel about them. Don’t leave anything unsaid since you just don’t know what is in store. Do you have songs that make an impact to you as well? I would love to hear about those and what they have meant to you. These three are the first of many that I will be writing about. In the future, I will write about some of my favorite dance songs, favorite love songs, songs that my family used to sing, and many other categories. Please give me some other suggestions, if you are so inclined. I wonder what music will speak to me tomorrow. I can’t wait to find out!! Yesterday, Ian and I weren’t feeling so great. Our allergies were giving us fits. Instead of our usual Sunday of going to church, lunch out with family, and then a lazy day, we simply had the lazy day. In the morning, we made pancakes and bacon with fruit. Ian and I had a Mickey Mouse and Minnie Mouse pancake and Kirk had a snowman pancake, among the usual round pancakes. These were made simply with the spoon and the batter and were quite fun! We had fun making food together, eating it, and then cleaning up. Ian is quite the helper in the kitchen! We then read, watched tv, and colored and drew pictures. 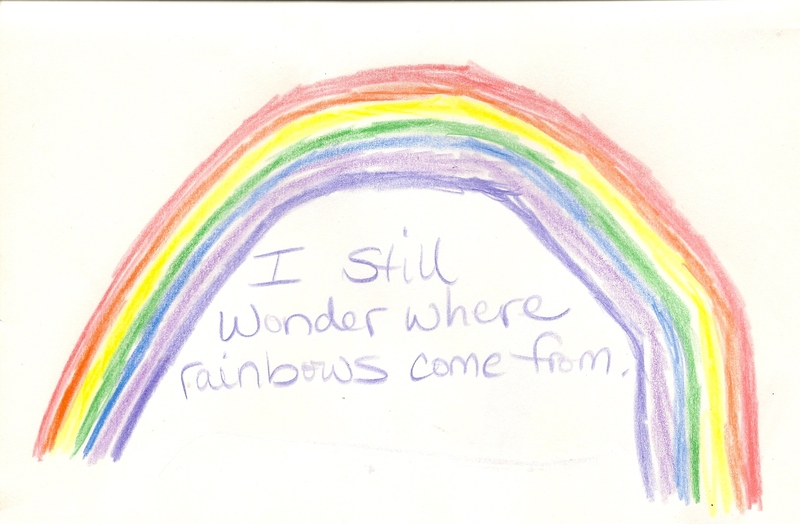 We were inspired to draw a few photos of rainbows. 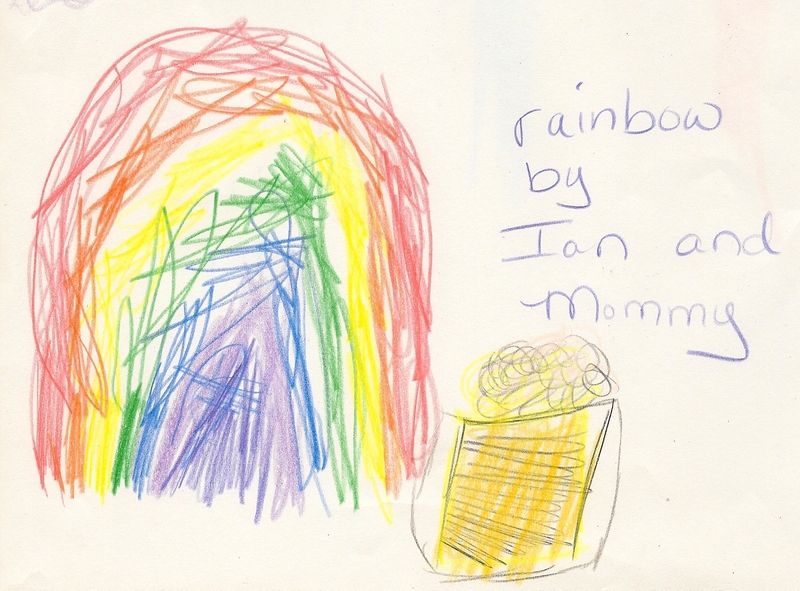 Ian has learned the 7 colors of them as I had (ROYGBIV – Red, Orange, Yellow, Green, Blue, Indigo, and Violet). Can I just tell you how fun it was to color and draw?! A friend of mine has a coloring book and encourages other adults to color when they come to visit him. This is a great idea since it is relaxing and fun to do. After all, crayons and coloring pencils aren’t just for kids!!! 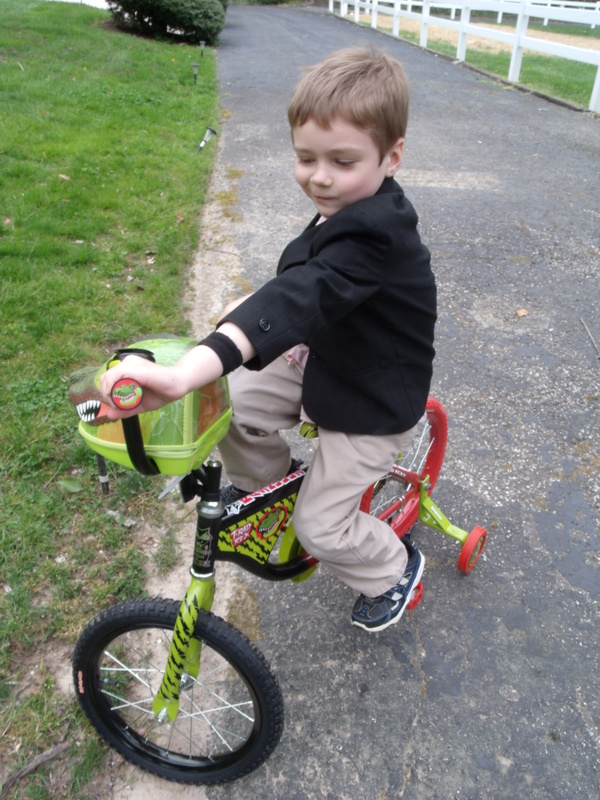 Last weekend, Kirk and I got Ian his first bicycle with training wheels. Ian had no idea that he would be getting this bike and he was so excited!! 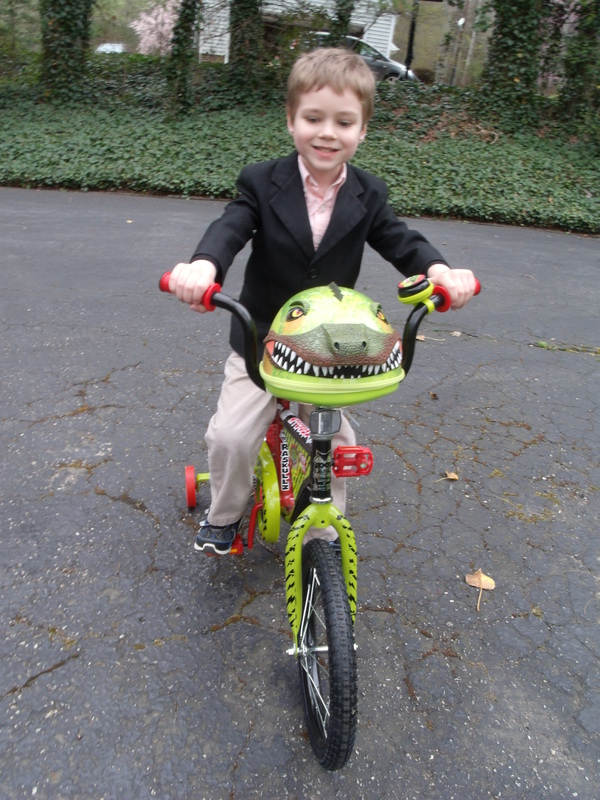 It is a T-Rad Rex (Tyrannosaurus Rex) bike with one black wheel and one red wheel. Ian loved getting this surprise! You can see how happy he is in these pictures! He has been riding it quite a bit in the last week and getting better each day. The next thing for us to get is a helmet for him. Then he will be all set! We will try to do that in the next week. I wonder if they make a helmet to match? We will have to have him with us to try it on. The face on the front of the bike can hold a toy or his helmet. The first day he had, he put one of his favorite toys in the bike and drove him around. The bike also has a bell. It is just the right height for Ian and he loves it! I love that he is so excited and now wants to be outside every day to ride it. Yesterday it was raining and he told me, “Mommy, I won’t be able to ride my bike today.” I told him “True, but you can the next day.” So we this afternoon he was out riding again!!! We still have a lot of practicing to do, which will help his legs get stronger and make it easier for him to ride, but we are on the way. He looks a bit overdressed to ridge in these pictures. don’t you think? 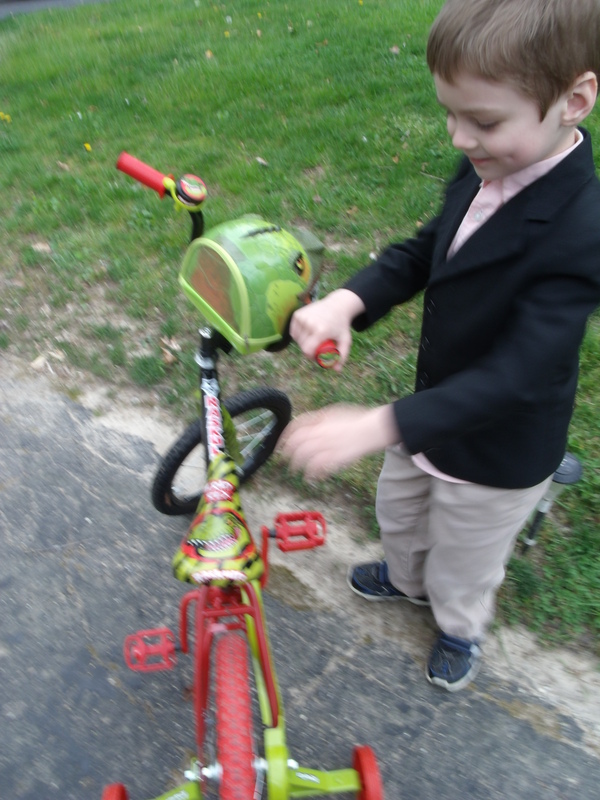 He got this bike on Sunday afternoon and we hadn’t changed out of our church clothes. He wanted to ride before he changed what he was wearing and we said sure. He did, however, change his shoes and was then ready to go. A boy and his n ew bike is exciting and means our boy continues to grow up! I intend to make the most of each and every minute I have with him. Childhood is great and enjoying the journey with this sweet boy is fabulous! I feel very fortunate. And, don’t you just love the look on his face in this picture? I have to say it was precious seeing him show-off his new wheels. I wonder if I will have as much fun with this bike as Ian will. I think so!!! Or should I say Jump! In thinking of Jump, I started humming the Pointer Sisters song, “Jump for my love.” And, there was the Van Halen Jump song as well. That was a fun one. 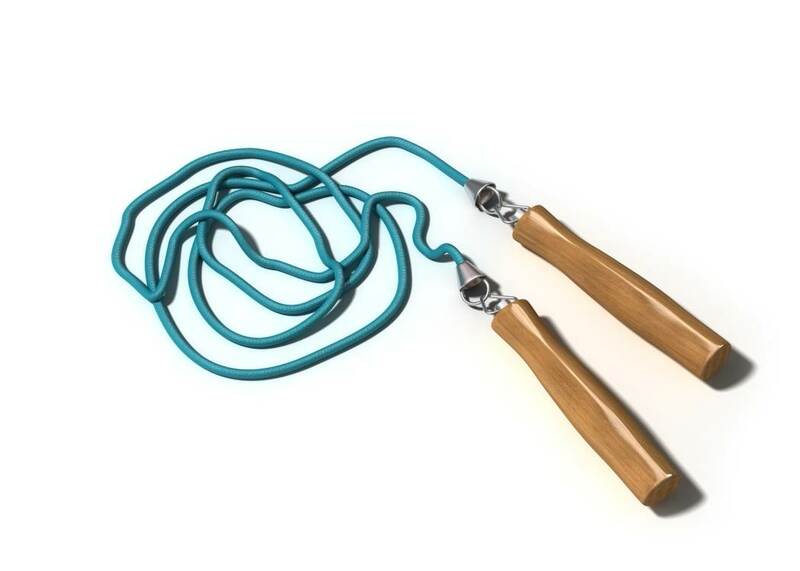 Other things I think of are jumping rope in grade school, people jumping the broom when getting married, and jump shots in basketball. Do you remember the movie, “White Men Can’t Jump?” That was a fun movie starring Woody Harrelson, Wesley Snipes, and Rosie Perez. Another part of jump is jumping into a new facet in life. I have a preschool age son who in the fall will start kindergarten. The time is now to prepare for this. It will be tough but I am excited for him and he is over the moon about it. I have also tried to jump into a weight loss and food change program. I am trying to make those changes as well. People say that change is good, but is too much at once a bad thing? I think it can be at times. I suppose we just have to take things as they come and try to make the best of them. I hope to do some jumping today! How about you? Read more thoughts on “Jump” at Lisa-Jo’s Five Minute Friday link-up today. This morning I heard about the terrible explosion in West, Texas. I want to lift up the residents of this town as well in my prayers. It is so sad to think that so much of the town was leveled and so many people killed and injured. 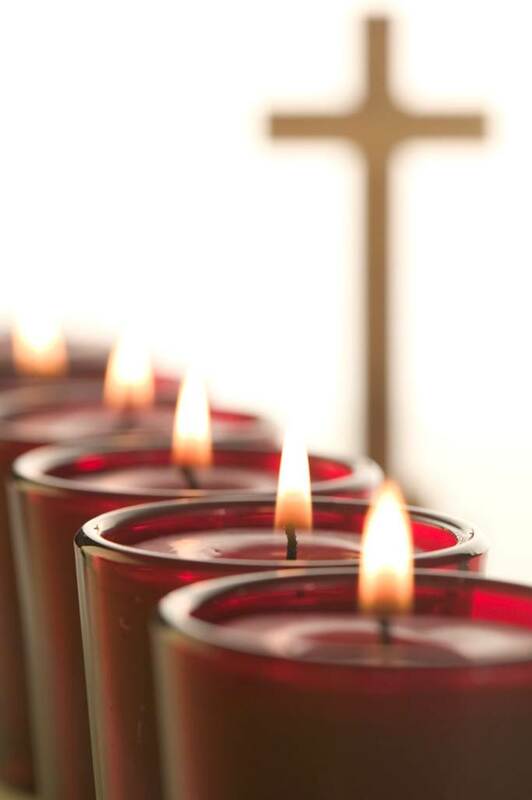 Lord, stretch out your healing hand upon the people and community of West, Texas. May they be comforted by you and each other. May you guide them as they grieve their losses. May we help those around us. In light of the bombings during the Boston marathon, I wanted to post a prayer. Please protect all of those impacted by the events this week in Boston, Mass. May those who sustained loss be covered by your love and care. May the injured be healed. May the city and its residents also heal – physically and mentally. May the city of Boston come back from this stronger than ever. May we not be afraid to gather at events such as the marathon because of fear. May things such as this not happen again. May time, love, and friends and family help in the healing process. 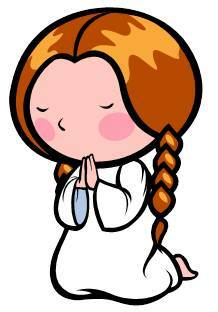 In your mercy Lord, please hear our prayer. This prayer isn’t just for those affected by this event but for all who are dealing with loss, pain and suffering. Today is my friend Rich’s birthday! Happy Birthday to you dear Rich! I hope that you have a great day! Rich is a great guy and has his own business. He can fix about anything and is smart. He loves Nascar, his wife, family, and friends, and to tinker around with a variety of things at his house. He is a lot of fun to be around too!! Many years ago, before I met Kirk, Rich nicknamed me Patti Cakes, and used to call me that for a while. Little did he know that my name eventually could be Patti Cates. Notice just one letter is different — the K which starts Kirk’s name. Interesting, wouldn’t you say? I have known Rich and his wife Karen for almost 20 years. Karen and I worked together in the same office for four years. During that time, we got together a lot. I was single at the time and the two of them always made me feel welcome and not like I was a third wheel. I have always appreciate that about them. One time we went to their beach house and had so much fun. We talked the entire way in the car since it was a road trip, and then continued when we got there. It is nice to not run out of things to discuss. For a time, Rich was the big brother that I never had. After I met Kirk, the four of us would get together and have a blast. It was great that all of us got along well with each other and liked each other. That is rare and I so appreciate it! Rich also tells great stories and jokes. He is always fun to talk to. I haven’t seen him or Karen in a while and miss them both. We now live in different states so it is more of a challenge to get together. We do, however, keep in touch, so that is great. Hopefully we can plan a get together soon!! 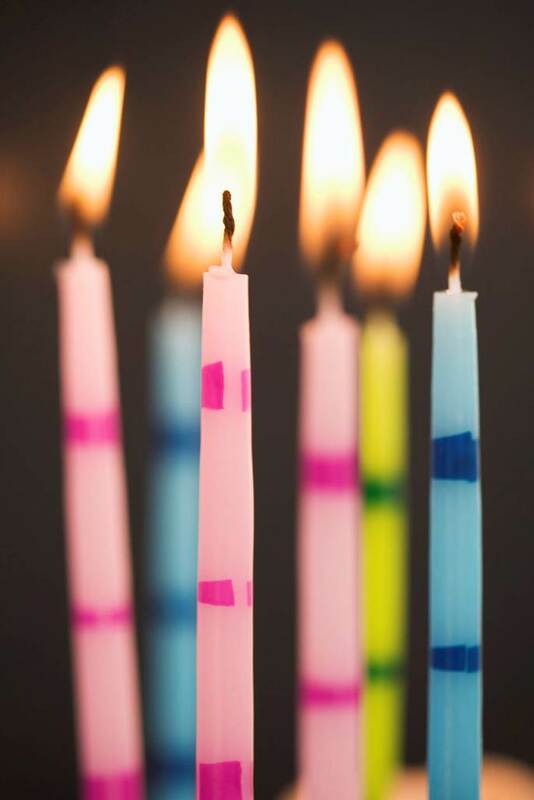 Happy Birthday to you Rich! May you have as fun a day as you are! Love you both!!! Hi and hope you are having a great weekend! I decided to try a new design for a while. What do you think? I would appreciate any thoughts! Good weekend so far! I am enjoying a flashback weekend on the radio. Some great old songs. Don’t you enjoy the songs from when you were younger? I sure do!! Tonight we are going to dinner with my mom. Should be a fun evening. Then church and brunch tomorrow with my parents. Last night I ate with them and my grandmother. Lots of wonderful family time this weekend! Spring has sprung all over! This is a beautiful weekend. Hope yours is as well.